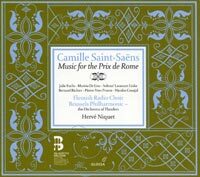 CAMILLE SAINT-SAËNS (1835-1921): Music for the Prix de Rome - Ivanhoé for Mezzo-Soprano, Tenor, Baritone and Orchestra, Le Retour de Virginie for Soprano, Tenor, Bass and Orchestra, Ode for Choir, Chœur de Sylphes for Soprano, Mezzo-Soprano, Choir and Orchestra, Credo and Agnus Dei for Organ from Messe, Op. 4 (François Saint-Yves [organ]), Motets au Saint Sacrement for Voices and Organ. Description: Saint-Saëns didn't win the Prix de Rome but he did do something no other composer did: he competed twice, once as a 17-year-old with Le Retour and the Chœur des Sylphes - both of which show his youthful admiration for Mendlessohn - and again (taking advantage of new rules) in 1864 when he was already quite successful and well-known. The notes speculate on his reasons for this but it produced the "cantata" Ivanhoé which is rather more like a Verdian opera scene in the manner of Il trovatore (the six-minute Ode to a Rousseau text was his short choral piece on this occasion). The set is fleshed out with 45 minutes of sacred music from 1857 (the Mass segments and the 32-minute Motets which is not otherwise available on disc). 2 CDs. French-English texts. Julie Fuchs (soprano), Marina De Liso, Solenn' Lavanant Linke (mezzos), Bernard Richter (tenor), Pierre-Yves Pruvot (baritone), Nicolas Courjal (bass), Flemish Radio Choir, Brussels Philharmonic; Hervé Niquet.